waw050264 WALES (1953). Distant view of Madoc quarry, Blaenau Ffestiniog, commissioned by Cawood Wharton & Co. Ltd.. Oblique aerial photograph, 5Ã‚Â½" cut roll film. 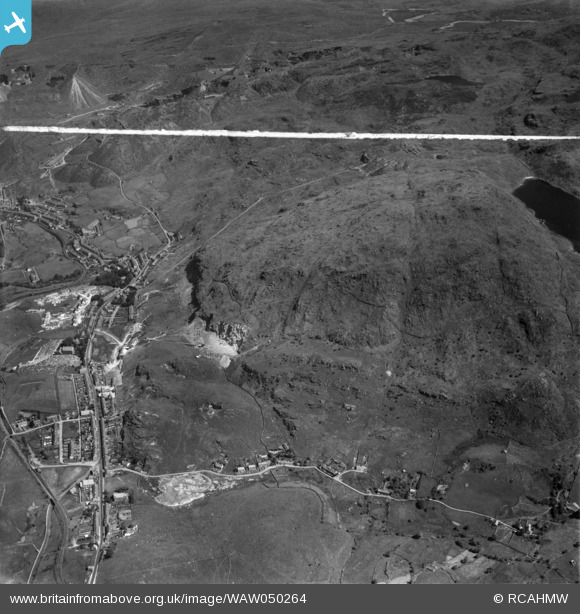 Title [WAW050264] Distant view of Madoc quarry, Blaenau Ffestiniog, commissioned by Cawood Wharton & Co. Ltd.. Oblique aerial photograph, 5Ã‚Â½" cut roll film. Tan y Manod locomotive turntable, which remained in use to the very last train in January 1961. Next to it can be seen the remains of the former engine shed. The shed closed as early as 1906 but remained in use for other purposes at least until 1936. Throughout its last years all except the rearmost few feet were demolished, but those last few feet supported the water tank which fed a "water crane" which also remained in use until the very end. Tanymanod Hall.Residence of the Vaughan family of the Tanymanod estate. Demolished early 1970's. Craig Ddu slate mill (remains of). Dwr Oer slate quarry. Worked from 1950 to 1972 by Meurig and Edward Evans.